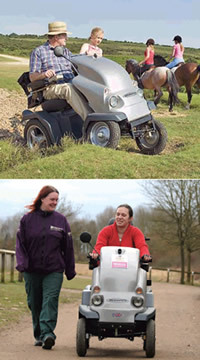 Derbyshire County Council Countryside Service currently have 5 mobility trampers available for hire at 4 locations, these are Shipley Country Park (x2), Middleton Top, Elvaston Castle Country Park and Tapton Lock Visitor Centre. The tramper scheme is set to expand with the purchase of 5 more trampers by the end of February 2012. These will add Creswell Crags, Cromford Mills and High Peak Junction to the list of sites. The scheme costs £15 per year, which gives unlimited use at any of the sites. There is also an opportunity for a new user to assess if the scheme is for them, with one hour of free usage. There is currently work on a twinning project with a similar scheme in Devon and Cornwall. This will allow registered user's from Derbyshire to use the Devon and Cornwall scheme and vice versa.